IMPORTANT: You must never electrically disconnect the MyOmBox box without first turning off the system using the “Stop MyOmBox” button in the application. MyOmBox is provided with an SD card, therefore unplugging the power supply without shutting down the system can cause damage, loss of data, and irreversible malfunctions. You must never remove or exchange SD cards from MyOmBox boxes. For license and network configuration reasons this may cause malfunctions. * Keep the box away from other electrical appliances that may cause interference. * Place the box in a ventilated place and away from sources of heat. * If you have electrical problems (overvoltage, power failure, voltage drop …), invest in the inverter installation to which you connect the MyOmBox mains power supply to protect the system. Example of inverters: FSP Nano 600 – Eaton Ellipse Eco 500. Before using MyOmBox, you must apply an installation process detailed below. If you encounter any problems, we advise you to call your installer. 1 – Your local network / ADSL box must be configured in DHCP at least for the first launch of MyOmBox. Most internet boxes are configured by default in this mode. 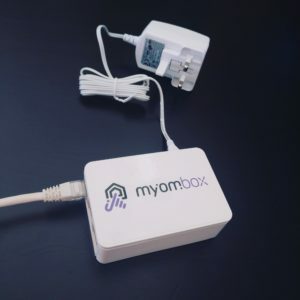 2 – Connect the supplied RJ45 network cable to MyOmBox and your router or ADSL box. 3 – Connect the power supply and wait at least 3 minutes for MyOmBox starts. 4 – Then you must put your smartphone in wifi mode so that your phone is on the same local network as MyOmBox. This is necessary for automatic configuration (only during the first launch). 5 – Now you can download or update the MyOmBox application from your AppStore or PlayStore and launch the application. If your system is well connected, you normally do not have to do anything else. It will connect automatically, whether from home or from outside. 6 – If your system has already been setup by your installer you can directly connect and use MyOmBox. 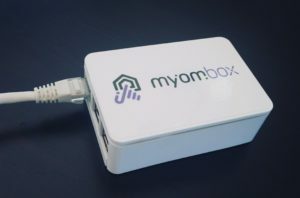 If you have never set up your MyOmBox then you need to connect to MyOmBox from a tablet or computer. Retrieving the local address of your MyOmBox by clicking on “My parameters” from the home of your mobile application, or by following our old notice. Previous PostAdditional tips and commands to know to fully use IFTTT with MyOmBoxNext PostHey Siri, how to control my MyHome Bus & MyHome Play system with Home app for iPhone / iPad ?